Earlier this year I heard the term kamishibai (紙芝居) used in the context of the Toyota Production System for the first time from a Canadian former Toyota manager during a LEI seminar. At the time I thought it was a gratuitous use of a Japanese term for a visual management storyboard in the factory but it seems there’s more to it than that. Looking into the origin of kamishibai it was interesting to learn that the paper theaters of my youth were in fact 12th century Buddhist moral dramas for the illiterate. The audience of the kamishibai could conduct a “self audit”, if you like, and learn from the visual presentation whether they were living their life in a moral way. In the modern day, pre-literate children are told stories or taught important lessons. In TPS Kamishibai are 21st century equivalent of audits of the kaizen culture. Kamishibai cards are like cue cards or work instructions for auditing a process. Here is an example of a card used in the kamishibai process. If you’re familiar with TPM (Total Productive Maintenance) you can make an analogy. Think of kamishibai as Autonomous Maintenance (daily, weekly, monthly checks) performed by the different levels managements and instead of checking places on the machines you are auditing places in the factory, production cell, environmental procedures, etc. Kamishibai prevents “breakdown maintenance” of the Lean system itself through audits, just as in TPM the regular equipment checks prevent machine breakdowns due to machines wearing, overheating, etc. The kamishibai board is a visual management tool like hour by hour production status boards are for supervisors and line managers. If hour by hour boards are used during the shift and on an hourly or bi-hourly cadence, kamishibai boards are used for weekly, monthly and even quarterly audits. The kamishibai audit items are placed on a visual board near or at the point of inspection. If a card has not been turned over to indicate “complete” it is obviously an abnormality. 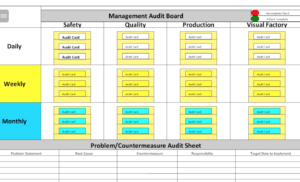 Just as taking corrective action based on an end of shift production report is not Lean behavior, auditing based on a book or instruction manual on a bookshelf is not Lean behavior. Kamishibai builds in the genchi gembutsu principle to audits. The standardized approach of the kamishibai board and audit routine minimizes difference between the individual preference, style or attention to detail between managers. This reduces variability in outcomes of audits between different people. It is another example of Toyota building brilliant processes that anyone can perform flawlessly rather than relying on brilliant people and hero behavior to get things done. The kamishibai boards also focus the attention of the management on the gemba. In order to do your job properly you need to go to the gemba, go to the boards, take the cards, and follow the instructions. It’s quite humbling when you think about it. The kamishibai process standardizes and prescribes the weekly, monthly and quarterly “standard work”, if you will, for managers to check and audit. How many directors and VPs of manufacturing in North America would gladly arrange their schedules around making that trip to the kamishibai board? Here is a link on the Toyota website to a PR piece titled Accelerating Environmental Initiatives as Global Toyota. Page 7 of this article talks about the environmental kaizen efforts and demonstrates the use of the kamishibai process for audits at TMMWV (Toyota Motor Manufacturing West Virginia). Kamishibai as part of the Toyota Production System clarifies the 5W1H (who, what, where, when, why and how) for auditing and then places the cards on a visual board. 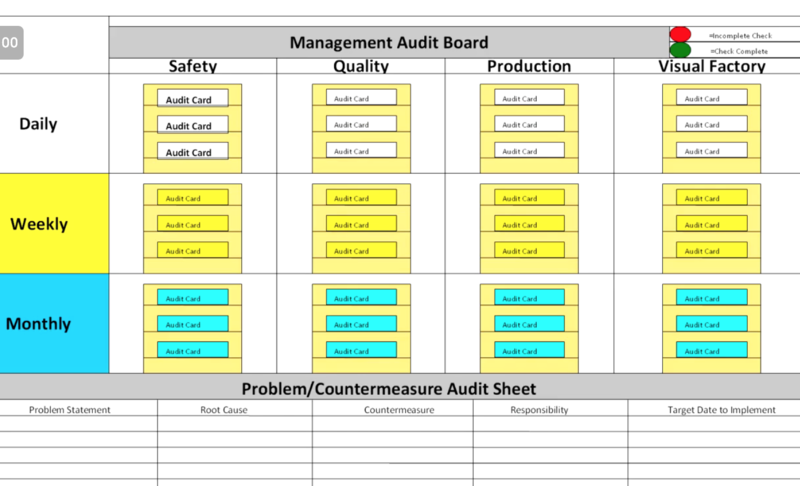 Part of the management routine in a Lean organization is to audit existing standards so that any deviation can be addressed and kaizen action is taken. The kamishibai is a way to make adherence to this process visual on the gemba. I want to put in place a kamishibai board in my workshop in order to substitute my plan of preventive maintenance. But, I would like to have documentations on the principle of operation of this system and, if possible an example of board. I’m very interested in Kamishibai techniques: could I have some pics as exemple of their applications?! thank you very much! I would like to ask about some presentation about system Kamishibai in production. Here is a one point lesson on the kamishibai system. As far as hardware, a board, paper, tape, pens, scissors, etc. can all be found at an office supply store near you I am sure. I am a freelance journalist working on a story about Kamishibai. I am reaching out for a comment regarding your post. I will be glad to give more information in a private e-mail. I would appreciate your prompt response.